UC Berkeley professor Saul Perlmutter and two other scientists won a Nobel Prize in Physics for their groundbreaking discovery that the universe is expanding at an accelerating speed, overturning the previously held belief that the universe was contracting. Perlmutter, also an astrophysicist at the Lawrence Berkeley National Laboratory, will receive half of the award while his fellow researchers Brian Schmidt, an astronomer at the Research School of Astronomy and Astrophysics at the Australian National University, and Adam Riess, professor of physics and astronomy at Johns Hopkins University, will jointly receive the other half, according to a press release by the Royal Swedish Academy of Sciences, which awarded the prize. The honor comes with $1.5 million and, for Perlmutter, a coveted parking space on campus reserved for UC Berkeley Nobel laureates. Perlmutter and his team of researchers began studying supernovae — massive cosmic explosions of old compact stars — in 1988 to measure the speed at which the universe was contracting. Schimdt and Riess began work with a competing team in 1994. Then, in 1998, both teams arrived at the same shocking results. By studying distant supernovae and using their brightness to determine the distance between stars at different points of time, they discovered that the universe was not only expanding, but doing so at a faster rate than ever before. The changing wavelengths of light — which went from shorter blue wavelengths to longer red wavelengths over a period of time — radiating from the supernovae meant that they were moving farther away and indicated that the universe was in fact expanding. While the press release suggests that the research’s findings show that the universe will end in ice, it is not known what that substance will be, Perlmutter said in a press conference held on campus Tuesday afternoon. It is Perlmutter’s optimism that makes him a great scientist, said Alex Kim, a graduate student who worked with Perlmutter, at the campus press conference. “At the time when I was a graduate student looking around for a project to work on … I remember talking to my friends and saying I want a really meaty project to work on and something where I could make a difference,” Perlmutter said. Perlmutter is the 22nd UC Berkeley faculty member to receive a Nobel Prize and the ninth to receive the Nobel Prize in Physics. 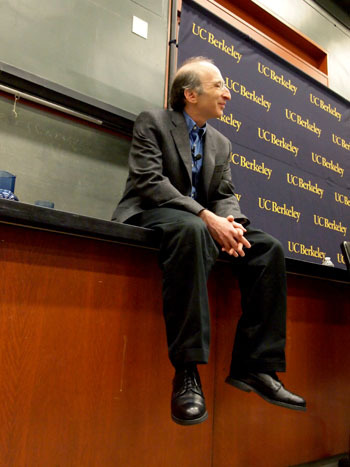 Perlmutter has been a member of the UC Berkeley Department of Physics since 2004. Jordan Bach-Lombardo of The Daily Californian contributed to this report.